Announcement Paintings and stories that celebrate the Women I Might Have Known, bouquets and Quilted Women. 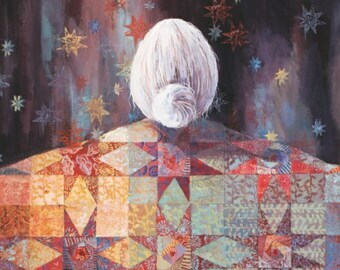 follow my stories of women on my blog on my website, www.SusanSchmittArt.com, and buy the paintings and cards here. 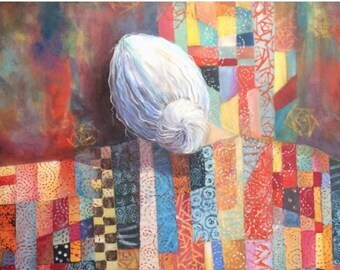 Paintings and stories that celebrate the Women I Might Have Known, bouquets and Quilted Women. Great transaction. Love the cards and artistry of them. Thank you. I love these. Can't wait to give them to my girlfriends at our Christmas gathering. Love the artwork. Perfect cards for some friends. Thanks very much! the tools of my trade - brushes, hand carved stamps, acrylic paints and a good paper! I am a Midwestern girl living in Colorado. I've drawn and painted my entire life. And since I have always enjoyed making small gifts of my art, I've found a way to share it with everyone. My company is Susan Schmitt Art and features a line of greeting cards, note cards, small original paintings, prints and coloring books. Local printer who works directly with me to produce my cards in small runs. I create the art and provide a design layout file that they print. I want you to be happy with my work and buy from me again and again. If, for any reason, you are not completely satisfied with your purchase, you may return the item for a refund providing you notify me within three (3) days of receipt. Shipping and handling fees from the original sale are nonrefundable. Buyer pays all return shipping costs. Item(s) must be returned in original condition and ready for sale. Refunds are issued though PayPal and only after the item in question is received. I accept PayPal. Payment is expected within three (3) business days from date of purchase. Sales tax will be added to orders shipping to Colorado. I ship US Priority Mail for 2-3 day delivery within the United States.. Please contact me to make other shipping arrangements. Shipments within the United States include Delivery Confirmation. Please contact me if you desire Certificate of Mailing, Insurance or Signature Confirmation and I will advise you of the additional costs. Insurance is the sole responsibility of the buyer as is filing any claims for damage. While every reasonable care is taken to ensure that your items arrive in excellent condition and in a timely manner, I cannot be held responsible for damaged, lost or misdelivered packages. Customs and duties for international shipments are the sole responsibility of the buyer. Please verify the accuracy your PayPal shipping address as well as your email address. Returned items due to an incorrect shipping address will incur additional shipping costs.